Airline pilots, who fly some of the world’s most technologically advanced machines, have long relied on paper navigation charts and manuals, which clutter the cockpit and have to be lugged around in cases that can weigh as much as a small child. Now, however, airlines are catching up with the tablet era, reports The Wall Street Journal (June 27, 2013). JetBlue Airways just received FAA clearance to provide its 2,500 pilots with Apple iPads that will store digital copies of the heavy paper manuals they refer to during flights. American Airlines said its 8,000 pilots had largely gone paperless now that the carrier has completed the rollout of its own iPad program. 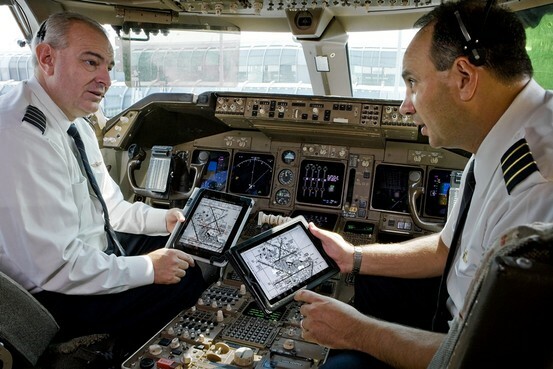 By storing manuals and navigation charts on iPads, American figures it has eliminated 3,000 pages of paper per pilot. In April, United started requiring its 10,000 pilots to carry iPads. Southwest started an iPad trial with 150 pilots this month and expects to expand it to an additional 550 pilots in the third quarter.